The NBCC Foundation has awarded Derek Smith of Oxford, Alabama, a 2014 military scholarship. The NBCC Foundation, an affiliate of the National Board for Certified Counselors, Inc. (NBCC), recently awarded a 2014 NBCC Foundation military scholarship to Derek Smith of Oxford, Alabama. The military scholarship is awarded to service members, veterans and spouses pursuing a counseling education who commit to serving fellow military personnel, veterans and families upon graduation. The mission of the NBCC Foundation is to leverage the power of counseling by strategically focusing resources for positive change. The military scholarship was created in 2009 to increase access to counselors for military personnel, veterans and families suffering from a shortage of available mental health professionals. Thirty-five students from across the country applied for the five 2014 military scholarships, and the NBCC Foundation Board of Trustees awarded an additional scholarship due to the high caliber of this year’s applicants. As one of six 2014 military scholarship recipients, Maj. Smith will receive $5,000 to support his counseling education and facilitate his service to military populations. Maj. Smith received his bachelor’s degree from the University of West Georgia, a master’s degree in divinity from Southwestern Baptist Theological Seminary, a Doctor of Ministry from New Orleans Baptist Theological Seminary, and is currently pursuing a master’s degree in clinical mental health at Jacksonville State University. He is a chaplain and has been in the Alabama National Guard since 2006. 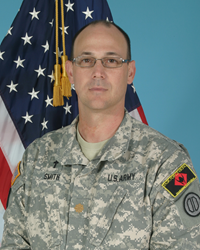 Maj. Smith was deployed to Kuwait in 2009 in support of Operation Iraqi Freedom. He has served on active duty with the Alabama Pre-mobilization Training Assistance Element at Fort McClellan since 2010 and is currently assigned to the 31st Chemical, Biological, Radiological and Nuclear Brigade. After graduation, he plans to remain in the Alabama National Guard and become a licensed professional counselor. The NBCC Foundation has also awarded six $5,000 minority scholarships designed to help ensure that the behavioral health needs of all Americans are met, regardless of language or culture, as well as six $5,000 rural scholarships to increase the number of counselors serving rural areas. The NBCC Foundation plans to continue offering scholarships to increase the number of counselors in the areas where they are needed most. For more information or to make a gift in support of the Foundation’s mission, please visit http://www.nbccf.org. The NBCC Foundation is an affiliate of the National Board for Certified Counselors (NBCC), based in Greensboro, North Carolina. NBCC is the nation’s premier professional certification board devoted to credentialing counselors who meet standards for the general and specialty practices of professional counseling. Currently, there are more than 52,000 National Certified Counselors (NCCs) in the United States and more than 50 countries.